I first heard about Hotel TerraVina online some time last year. It’s a boutique hotel situated in the New Forest and was devised by the people who put together the Hotel du Vin chain. The emphasis is on good food and wine (two of our favourite things) and while staying there, you can also learn the art of sabrage. When we were in Champagne a few years ago, we saw lots of people taking the tops off Champagne bottles with swords but never got the chance to try it ourselves. It seemed like the perfect birthday present for Stephen so I booked it and tried to keep it a secret until the day arrived. I’m not very good at keeping secrets but I managed this one and on Wednesday afternoon, we drove down to the hotel where we were greeted warmly by the staff before checking into a beautifully decorated bedroom with a view over the nearby forest. The rooms are all named after different types of wine and are all individually decorated, many with roll-top baths in the rooms. The emphasis is definitely on quality with handmade toiletries from nearby Wiltshire in the bathroom and bespoke furniture in the bedroom made by local craftsmen. As lovely as the room was, we were keen to investigate the well-appointed bar that we had spotted on our arrival. After perusing the open-faced wine cellar, we chose a glass from the extensive and well-researched wine list that specialised in Californian wine. Not the nasty, over-oaked type that was once associated with California but the perfectly balanced, full-bodied examples that we both love. After finishing our wine, we were led outside where Stephen was shown how to use the sabre to remove the Champagne cork by one of the hotel’s expert sommeliers. After the short lesson, it was Stephen’s turn and he did a great job of taking the cork off while making the whole thing look very easy. Back in the warmth of the bar and while enjoying our Champagne, we were presented with the evening’s menu which had a good selection of both meat and fish dishes (there were probably some vegetarian dishes too but we didn’t register those) with a heavy bias on seasonal and local produce. We struggled to choose as everything sounded wonderful and it was obvious that a lot of time and thought had been put into creating a compact menu with quality ingredients. I opted for the lasagne of crab and langoustine to start and Stephen chose the loin of rabbit. 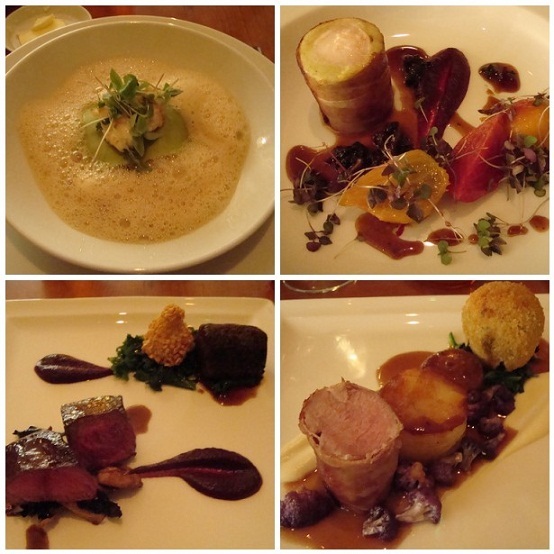 The presentation of both dishes was beautiful and the flavours certainly didn’t disappoint. Crab and langoustine lasagne is one of my favourite starters and the execution of this dish was stunning. The basil added a slightly unusual note that I hadn’t come across in this dish before but, coupled with the lemongrass, was a fragrant compliment to the sweet and perfectly cooked fish. Stephen’s rabbit dish was heartier than my fish but was well balanced and just the right size to not be too heavy. Even though I’m not a big fan of beetroot, I could tell that this worked well with the earthy rabbit and was a great nod towards the change in season. Neither of us could decide between the pork and the venison main courses so we had both with the intention of sharing. I preferred the venison and Stephen the pork so the decision was made for us quite quickly. The standout for me was the slow roast venison which just melted in the mouth. We fought over that as we did the black pudding that accompanied Stephen’s pork: a great combination and one I’ll definitely try again at home. By the end of the two courses we were both reaching capacity but were so enjoying our time in the restaurant that we ordered a plate of cheese to share which we polished off with some dessert wine. 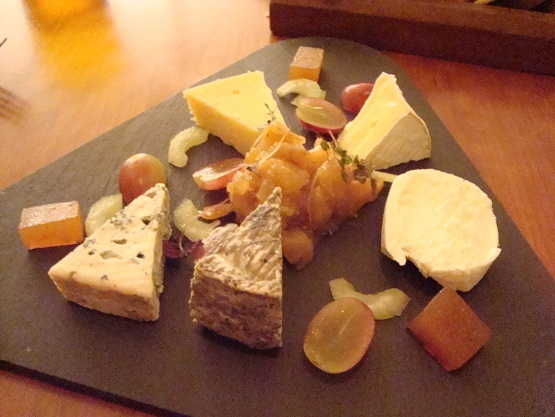 I can’t remember what all the cheeses were but they were the perfect way to finish off a brilliant meal. Things got a little hazy after that, for which I’ll blame the absinthe fountain. It was great fun and made even more enjoyable by the knowledgeable and charming barman who was happy to answer our questions. The full English breakfast we ate the next morning was definitely required to heal our heads and was prepared with just the same level of care and attention as the food had been the night before. It was a brilliant trip and I can’t fault the food, the wine or the service. Since it was a gift, I can’t reveal the price here but it was great value and if you’re looking for a slightly unusual way to celebrate then I would definitely recommend the sabrage break. The hotel also offers a number of other wine breaks often with visiting winemakers which we hope to return for next year. Subscribe to comments with RSS	or TrackBack to 'Hotel Terravina'. Sounds fantastic. Cowie and I have been keen to go ever since we heard about it during the summer. Wow, what a fantastic birthday present. Many happy returns Stephen! Sounds like you had a wonderful time and I’m drooling over the keyboard now, from the fab dishes you describe.